By this time period, racing's nemesis 'cost factor' was again dictating the terms at many track's and Stockton was no exception, with the cost of a competitive hardtop ranging from $1,500 to $2,000 which had brought the 1952 car counts down to an unacceptable level forcing the track operators to introduce the Jalopy era. According to J.D. Gentry, one of the drivers of the era, and a 'standout' performer on the quarter-mile Lodi Grape Bowl dirt track, the car counts were so high that only the first fifty cars in line at the pit gate were allowed entry, with the others waiting in the parking lot for drop-outs and a chance to compete. The cars used P-5 I Mustang fighter seat belts that were chained to the floor, and five gallon Jeep gas cans for fuel containment. The fuel itself was airplane gas, that depending on availability, ran from 110 to 140 octane. He says that before they left home for the track, they inflated their tires to 50 or 60 pounds to achieve needed stagger by the time they arrived at the speedway. Another trick was to remove the thermostat and install a 1/2 to 3/4 inch washer in the housing to slow the flow and help in cooling. They also removed up to half of the impellers off the water pump. Removing the right front brake also contributed to better cornering. A driver by the name of Shorty Ross of Stockton gets credit for the first ever Jalopy main event win, as the division car count jumped from an opening day figure of 13 cars to over 50 per week in just one month of racing. In early May of this year the final Roadster show was presented at Stockton with sixteen cars on hand and the final main event win going to Lodi's 'Lighting' Lemoine Frey. Another change came in the form of a new flagman on the stand by the name of Jack Houston, (in action to the left!). 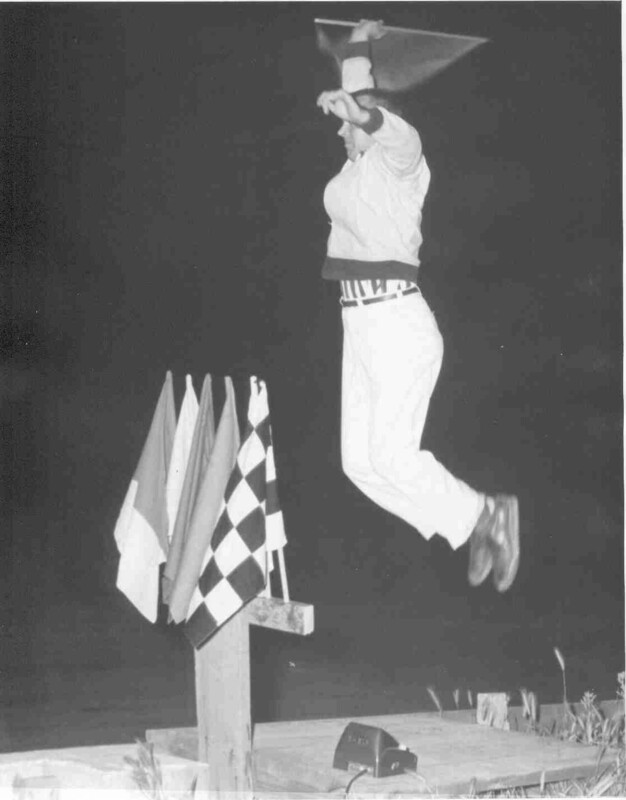 Jack was the first flagman at the Kingdon Dragstrip, also owned by Billy Hunefeld, in 1951 and had been flagging the west coast 'big cars' (Grand Nationals) in 51 and 52. His fame in racing would grow onwards, flagging over 87 tracks in his still current career, including Winston Cup events at Riverside and Ontario Speedways in 1971. Several drivers owe the lack of serious injury and even their lives to the quick thinking of Jack, in moves on his part to drag drivers from flaming cars with no regard to his own safety. He was a no-nonsense flagman, and you quickly learned who was in charge when he was on the stand. You got a black flag for two laps, and just as often as not found the flag in the cockpit next to you as he threw it in on the third pass. (a move I'm pleased to say I witnessed several times before his retirement from flagging). Stories abound about Jack throwing red flags and walking off the stand over the hoods and roofs of cars to reach the driver's window to discuss ancestry.